David Deanie is a magician using Add to Event to find new business, we chat to him to find out more about being a self-employed magician. David has managed to do what many of us hope for, and made something he loves into his career. He tells us about how he became a magician, some of the events he has performed at and how Add to Event has helped him find more clients. Anyone can learn a magic trick but it’s a bit more challenging to pursue a career as a full time magician and I can’t believe I get to do what I love every day. I joined the Glasgow School of Magic in 2000 which, despite what many people believe, is nothing to do with Hogwarts. I then continued to learn magic from other magicians and books and started winning competitions. I graduated with a degree in international business then started to look at a career and decided to set up my own business. 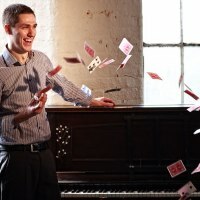 I had won Scottish Young Magician of the Year and been accepted as an Associate of the Inner Magic Circle with Silver Star for performing at the world famous Magic Circle (which is quite rare), I had public liability insurance and the knowledge of business from my degree to set up my company. After seven years of being a full time magician I haven’t looked back - I have been able to do something I enjoy and support my beautiful wife and two daughters. It is the best job in the world! I really enjoy the Variety and the challenge of what I do. Every day is different- I can be flown internationally to perform one day and the next day I am performing at a golf club 5 minutes along the road. I perform at all the standard events you might expect to see a magician like a wedding or a corporate event. However, it’s always exciting when I have a private booking that cannot be disclosed, like an embassy, media, or VIP event - Magicians are notoriously good at keeping secrets! Do you have any interesting stories or things that have happened? Worked with any celebrities/famous clients? Name dropping isn’t important to me and doesn’t make me a better magician – but I try to go above and beyond and treat all my clients and their guests like a celebrity. I have had the chance to perform magic in French which really made guests feel that their host had gone the extra mile to make the event special for them. One of my most memorable gigs was a wedding at a castle in Cheshire where I was booked as an undercover magician to surprise guests during the course of the wedding which was filmed for Channel 4. The whole day was brilliant and an exciting way to perform but the biggest surprise was arriving back to my dressing room where I discovered an enormous picture of the semi-naked bride and groom that was given to all of the performers and guests…I really hope that wedding tradition doesn’t catch on! What are your aspirations for the business over the next few years? My wife now works for me so I have more time to perform and come up with new material while she concentrates on the admin - I’m living the dream! As I continue to work with previous clients I am also looking to find new business, new venues and make each event special and unique. Also, having a young family I want to continue providing for them and obviously teach them a trick or two – basic principles of misdirection and pick pocketing at an early age will set them up for life! Ultimately my aspirations are to perform more and keep enjoying what I do. How have you found using Add to Event? It is easy to use and looks very professional. It makes it quick and easy to respond to leads and simple to find out details of each event. It is very useful having the distance to each event, it saves a lot of time and means you can get back to leads sooner. Please tell us about a booking you've had through Add to Event, how did it go? I had a last minute lead for a Wedding - I had all of the details and everything was booked very quickly and efficiently. The Add to Event website made it easy to see when there were replies and save going back and forth like many other agencies and websites. I would definitely recommend this site to both suppliers and clients because it has worked so well for me. David is a great example of a skilled entertainer making a name for himself in his local area and beyond. He’s found Add to Event simple to use and found many of the site’s features helpful in saving time dealing with new leads. If you think we could help you, why not join today?